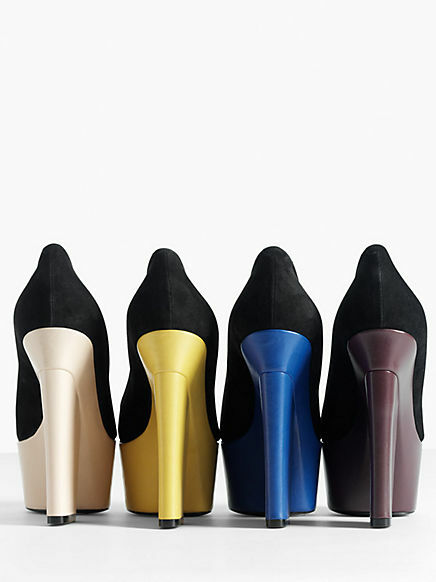 take a look @ these gorgeous shoes directly from heavenly Céline website. date un'occhiata a queste scarpe DIVINE, direttamente dal sito di Céline. Want to see more of the shoes! hahahaa funny and nice post! I like the colors , but I can't really judge them without seeing the front aswell. Grazie per il tuo commento! Adesso ti seguo anch'io! Geniales!! Ah! y ya que estás en el cielo si ves a San Pedro le saludas de mi parte, vale? Oh boy! Honestly, Celine can do no wrong. I think we share the same obsession. You always find items that inspire me! come si fa a non impazzire?! haha i laughed when i read that first line! Oh wow! I've just joined you!!!!! Hi Valeria, these heels are fantastic. You can't go wrong with Celine. Thanks for leaving a lovely comment, those heels are absolutely amazing. Funny! Btw this shoes are truly amazing, of course I follow you dear :), follow me back ! Gorgeoussss Shoes!!! Thanks for checking out my blog. I'm now a follower! beautiful shoes, all of them. simply gorgeous...i think heaven is a place on earth!!! i love it! I'll take the blue and the yellow! Oh, and yes, I'd love to follow each other- thank you! I love the blue ones, amazing! Thank you for your sweet comment on our site! Lovely blog. This heels are incredible. Thanks girls!!!! Hugs to you all!!! Oh good grief...They're just heavenly! Que blog tan bonito, te sigo. WOW. All I can say is wow.. that is one cool shoe! Thanks for dropping by. I am not following you. Amazing shoes. You always have the best ideas to share. I am now following your blog. I love the idea of blogging from the beyond :) These shoes are awesome! Check my blog out come time.